LabStorm: Who gets to decide? GlobalGiving, the first and largest global crowdfunding site, has been shifting the power in the philanthropic community since its inception 15 years ago. Annually, GlobalGiving delivers 40 million dollars to over 3,000 nonprofits across 165 countries, and now they’re going further. They brought to a recent LabStorm a pilot program that seeks to bring the organizations and people they serve more directly into the grantmaking process. GlobalGiving is unique in its ability to deliver funding to local organizations in the wake of natural disasters. When disaster strikes, GlobalGiving creates a fund to which individual donors can contribute. Then vetted organizations who already raise funds on the platform are eligible to apply for grants from those funds, which cuts down on the time it takes to get resources on the ground, and increases effectiveness of those resources because they are being used by local organizations. This serves to fill a funding gap that often arises in these times of immediate and intense need. In the last 5 years, GlobalGiving has raised and distributed approximately 20 million dollars to local organizations in times of natural disasters. After the immediate needs of a crisis are largely met, there are still often various recovery efforts underway that continue to be supported by GlobalGiving disaster relief. These recovery efforts span from rebuilding health clinics to bolstering psycho-social support to amplifying education initiatives. It is in supporting these efforts that GlobalGiving is exploring a pilot to incorporate the views of beneficiaries into their grantmaking decisions. Community foundations often exhibit good practices in incorporating the voices of beneficiaries into their grantmaking decisions. How might this practice look in disaster recovery, if the stakeholders include local relief organizations, beneficiaries, and GlobalGiving? It was evident from the energized LabStorm that the possibilities are endless. Who should give input and at what level? What does successfully collecting feedback look like? How should an effective constituent driven program be implemented while still being respectful of people’s (very limited) time? Is it more important to design a program within one community or between several? Despite the many underlying questions still to be answered, LabStorm participants came up with three overarching things to consider as GlobalGiving continues exploring the pilot. Take the pulse of the community. Establishing a quick storytelling initiative within a community can help determine what’s important, even before defining which sector feedback is needed from. Our members have tapped into community needs in a variety of ways. Accountability Lab’s Integrity Idol “name and fames” elections of honest government officials and enables citizens to interact with their governments in novel ways that create trust. Pathfinder provided an example of utilizing existing power structures to put citizens at the center. Their process brings citizens and village heads together to walk through their shared space and collectively point out what isn’t working. In this way, citizens are able to not only communicate but also illustrate their needs to those in power. Use commitment to collaboration as a proxy for voice. In small communities like those in which GlobalGiving’s partners work, citizens and program leaders alike are familiar with each other. They know who works where, who gets the money, and who’s actually doing the good work. GlobalGiving can create a space for collaboration among local partners, instead of a competitive environment. Not only will the collaboration help GlobalGiving determine which organizations are more active and engaged – and therefore capable of utilizing the funds most effectively – it will establish a long-term commitment to the success of the program. Piggyback on existing communication structures increase feedback participation. It’s tough to delineate exactly who to ask for feedback in this context, especially if individual organizations have their own constituencies and beneficiaries- which may bias their feedback on where the grant money is best spent. One way around this issue is to piggyback on the many existing communication networks already in use. 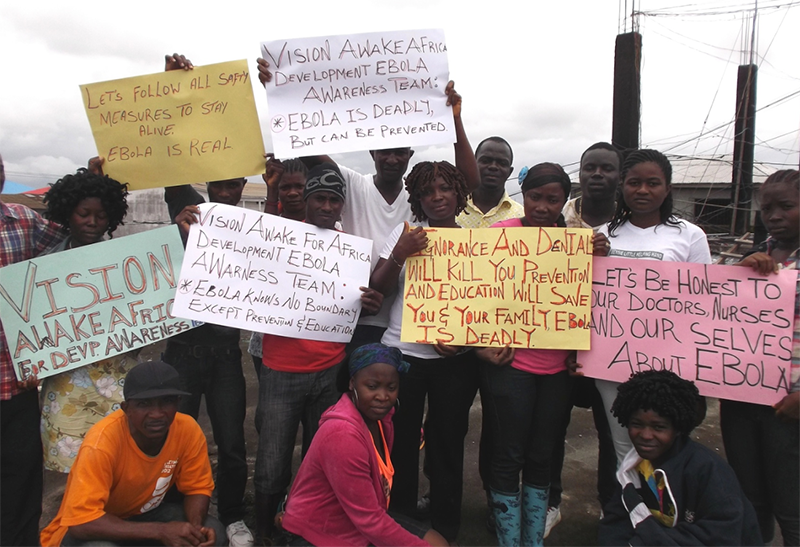 Many communities during the Ebola crisis developed intricate networks of communication to pass information between community leaders and members. Organizations like Mercy Corps and IRC may support existing communication networks which could be utilized to get a representative sense from beneficiaries where their priorities lie, and how GlobalGiving could best align their grantmaking with the needs of the community. There are a myriad of ways to get power in the hands of the people you intend to serve, and none of them are easy! Stay tuned as GlobalGiving works to find the best way to incorporate feedback early and often in the context of disasters. Want to stay involved? Reach out to us at [email protected] if you’d like to learn more from Britt and her team at GlobalGiving. Contribute your thoughts below and check back here, on the Feedback Labs Blog, for updates on how we help drive this momentum forward. As acting Chief Program Officer, Britt oversees relationships with more than 3,000 nonprofits, including managing all of GlobalGiving’s impact measurement, capacity building work, and disaster relief grantmaking. In addition to almost a decade at GlobalGiving, Britt has worked at the Bill and Melinda Gates Foundation and with a variety of non-profits in Sierra Leone, South Africa, Kenya, and Zimbabwe. Britt holds a B.A. in International Studies from the University of North Carolina – Chapel Hill, a Master’s in International Relations from the University of Cape Town (South Africa), and a Master’s in Public Affairs from Princeton University’s Woodrow Wilson School.